Kilian Hübinger found his first vocation in life in music, and it was only after finishing university studies with a degree in Jazz Saxophone, when he felt the calling to consciously explore the more fundamental questions of life. During extended travels he opened his heart to the beauty in manifestation and to the deeper conditions of human existence. In 2008 his way led him to study yoga with Agama Yoga in Rishikesh, India. Pursuing his practice he noticed powerful transformations taking place in his being, and consequently the wish arose to share these teachings with others. 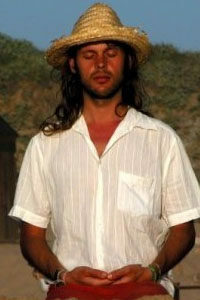 Kilian completed the Agama Yoga Teacher Training Course in 2011. In the meanwhile, he had found even deeper inspirations in the teachings of Hridaya Yoga and thus continued his studies with the Hridaya Yoga and Meditation Teacher Training Course in 2012. Since then, he has been teaching yoga during a 10-month stay on the Spanish island of Menorca and returned to the Hridaya center in Mazunte in 2013, offering his service to the development of the school as manager of the maintenance department. Apart from teaching yoga, he is still playing music, exploring sustainable ways of living and continuously deepening his practice of living lovingly and peacefully with an open heart.